Construction investment, activity and employment are all slipping downward in Miami-Dade County after an almost straight run up in the recovery from the Great Recession in the last decade. Though cranes continue to dominate the skyline in hot areas of Miami-Dade like Edgewater where high-rise residential development is being completed, new construction starts are falling. As current major projects like Brickell City Centre have been completed, fewer new ones have started to take their place. The total value of new construction starts in South Florida was off 26% in November from the November 2015 totals, Dodge Data & Analytics reported last week. Nonresidential new construction starts fell 32% and residential starts fell 22%. The year as a whole remained in plus territory for overall new starts, but in single digits at 9%, a far cry from the heated numbers of 2015 and earlier 2016. Nonresidential starts were up 11% and residential starts up 8%. The changes in new construction work were paralleled by slipping construction employment totals in Miami-Dade, where 44,500 persons worked in construction in November, down from 45,900 in October and 46,000 in September, according the US Bureau of Labor Statistics. Those employment numbers had been rising steadily since they plummeted from 56,600 jobs, the record for the county, in September 2007 at the end of the last huge housing boom to a bottom of 30,100 jobs in January 2012. The dip in construction employment comes as the county’s total non-farm wage and salary employment reached 1,163,700 jobs in November, highest in history according to records from the Bureau of Labor Statistics. In the month, unemployment fell to 5% in the county, lowest in the bureau’s records since June 2008’s 4.9% unemployment. Elsewhere in Florida, however, construction employment continues to remain strong. 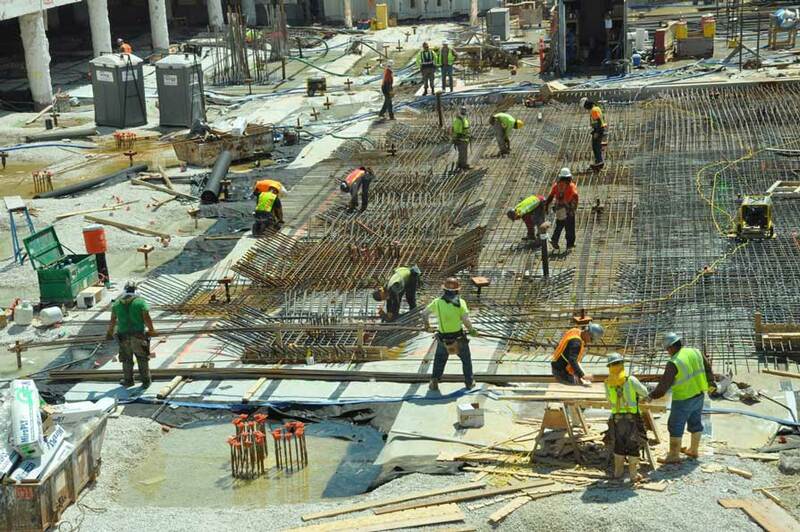 The Washington-based Associated General Contractors of America last week put Southwest Florida’s construction activity about 1% ahead of November 2015 and cited difficulties in finding skilled trades construction workers. Florida as a whole registered about 467,100 active construction workers in November, up 5% in a year. For the first 11 months of 2016, according to Dodge Data, the total value of new construction starts in Miami-Dade totaled more than $9.9 billion, putting the county well in range of a $10 billion year, considering that despite the 26% total decline in new starts for the month, the value of new starts in November alone was almost $547 million.